RORY GALLAGHER- "JUST STRAIGHT AHEAD ROCK"
"The show verged on riotous performances, and the kids shook their fists in salute, just like they do for their other heroes, Kiss and Aerosmith. Rory scunched up, his face, unwilling to believe that he causes the same kind of mindless reaction. "I don't know,' he said. "I don't think I'll ever use the smoke bombs.'" Rory Gallagher is lunching in Los Angeles in one of those English-type merry old inn establishments that usually feature roast beef and horseradish. The waitresses bustle about decked in red dresses with highly starched aprons, and the names of the places are interchangeably "Ye Old Copperfield's Lion's Head Tavern" and all the possible variables. Irishman Gallagher should be one of the wall portraits on the wood paneled siding. He's dressed in no-nonsense practical rather than fashionable blue jeans and a red checked hunting shirt. One is disappointed to find him not drinking Guinness stout. Legend surrounding the hard rocking guitarist would have you believe that he bathes in gin and breakfasts on hapless Journalists. His attitude this winter afternoon is optimistic, helpful and gentle. Is there something wrong? Rory has never compromised the strain of blues-making, non-distorted guitar philandering, which is his distinctive trademark. Throughout a fifteen year professional career, his idols have remained the stalwarts of American and British blues: Muddy Waters and John Mayall, to name just two. Through a new found American interest in guitar virtuosos (Ted Nugent and Robin Trower are examples of others basking in new found popular attention), Gallagher's tours are filling close to sold out, and his newest album, Calling Card, is climbing its way up the trade record charts. At his Los Angeles Shrine Auditorium gig, Rory's group never sounded so loud or so bold; Lou Martin on keyboards, Gerry McAvoy on bass and Rod De'ath on drums backed Rory in an over two hour revelry which included some solo picking that rambled on endlessly in a melancholy fashion. The rest of the show verged on riotous performances. The kids shook their fists in salute, just like they do for their other heroes, Kiss and Aerosmith. 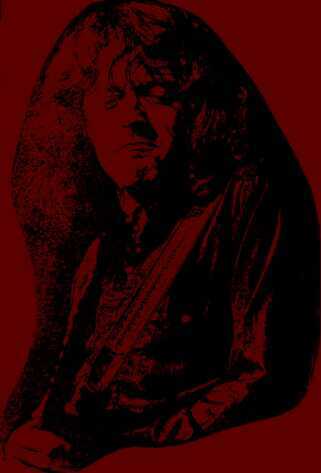 When I mentioned this salute to Rory, he scrunched up his wide-eyed, heart-shaped face, unwilling to believe that his playing causes the kind of mindless reaction that greets the heavy metal groups. "They're all good, I suppose. I don't know. I know that the kids enjoy it. I'm glad they like me, too. It's a different premise I go for. I don't think I'll ever use the smoke bombs. I'll always just be straight-ahead rock," he quips. There's no dispute that Rory has never given in to commercialism in his music. His second album for Chrysalis is produced by ex-Deep Purple bassist Roger Glover and is a marked departure from his earlier self-produced LPs. 'I liked Roger's work with Deep Purple," Rory said. "I'd met him a couple of times. He wasn't with Deep Purple. We were both sort of working on projects at Musicland Studios in Munich, and he fit right into my concept of the album. That Musicland is a total recording experience, you know. That studio, if only it could speak! What stories! You see, it's a whole lot of session rooms, and like a hotel quarters set-up, too. One could get lost there for months. But we took about four months to record Calling Card and did a tidy job of it. The one single from the album, Moonchild, is receiving radio air play and is almost too fluffy to be a Gallagher song. "The song is sort of an open refrain to a fantasy woman I know," he says, winking his eye and giving the old Irish shrug. "It also addresses itself to the child in all of us, the innocent in us, in me. I am a Pisces, a water sign, and I flow about quite freely." Musicland in Munich has as much of a raw reputation as Rory. Another Deep Purple, Ritchie Blackmore, has recorded two solo albums there, and almost plundered and pillaged the location to bits. 'It is a place to have a good time. What else are you going to do 2000 miles from home? So we drink, be merry .We work. We tried to record Barley & Grape Rag in a corridor of the studios. This is in the canteen, or the bar room, and we already had stoked a couple of pints, and we thought the place would be perfect to tape the damned ditty. At the time, I thought we sounded quite jolly. The next morning I looked at Roger, he listened to the tape and we re-did the thing properly and soberly. It wasn't half as much fun. But the first one sounded like we were in a dungeon." An excited Chrysalis publicist was calling all the press in Poland about Rory, managing only to disgruntle a few and pester the rest.. What happened is that Rory performed three days in Warsaw as a cultural exchange. "Well, we were invited. I don't know why us. But a group calling itself the Polish Jazz Society asked us over. I thought, why the hell not? Maybe we'll play Russia next year. We're negotiating deals with cultural groups in Vladivostok and Moscow. Playing Warsaw wasn't that much different from a large concert hall. The kids were awfully quiet, though. Very attentive and extremely polite." Gallagher has tours planned by his manager and brother, Don Gallagher, well into this summer. Rory says that he'd like to learn piano and sight reading when he's got some time off. He playfully suggests overturning the table to make legitimate those nasty rumors about his behavior. Instead, I find him to be a genuine romantic and gentleman.